Why is a basic redundancy rule ignored in some managerial and technical systems although it should be of vital importance? Car drivers all over the world continue a discussion regarding a necessity of keeping a spare wheel in a car. There are many drivers among us who suppose that, if they have a compressor, a tire repair glue as well as a mobile connection and smooth road up to the nearest service station then it is possible to drive without a spare wheel. However, there are many opponents in this discussion who were unlucky being in pitch without above mentioned technical aid opportunities. As to long-haul trucking professional drivers they don't debate the topic at all - it is out of question for them that there should be a certain number of spare tires en route. Often we are able to see on highways how they are carrying them over. Therefore, it is common requirement of providing for redundancy solutions to enhance security in different modes of transportation as well as in technical systems of all sorts. The safety of flights of aircrafts is ensured by means of even triple redundant systems well known in engineering as Triple Modular Redundancy (TMR). A main feature of TMR is that if one component fails then its mistake always has to be blocked by two others. In such a triply redundant system, all three components must fail before it entirely fails to function. It is not difficult to imagine that in fact a redundancy is a basic universal rule of ensuring security widely used in engineering and technology, which has always existed in nature and continue spreading within different spheres of human life. Now let’s take a look at the context of redundancy rule on the problem of increasing security of energy supplies to the EU, which the European Commission is currently paying a particular attention. European Energy Security Strategy presented by the European Commission in May, points out that "For the winter ahead, the Commission will work together with Member States, regulators, Transmission Systems Operators and operators to improve the Union's immediate preparedness in respect of possible disruptions (supplies)”. We can see that the European Commission proposed decisions on this important issue taking into account a redundancy rule in general. The Strategy determines in particular that "investments in back-up infrastructure are now obligatory". As for natural gas the Strategy gives a great deal of attention to diversification of infrastructure - 27 projects in gas were identified as critical for EU's energy security in the short and medium terms. Their implementation ultimately is expected to enhance diversification of supply possibilities. It obviously complies with a basic redundancy rule since that envisages a usage of several gas pipelines acting as back-up transport capacities relative to each other. However, it raises significant worries and doubts that dozens of the projects listed in the Strategy are very far yet from commencement of operation. While implementation of some part of the projects has only commenced the other part is on even more earlier stage of pre-feasibility, permitting and financing issues yet. It means that the Strategy implementation might contribute to increasing diversification of gas supplies but it could happen only after 2017. Moreover, there is only one new pipeline within the list presented in the Strategy - Trans-Anatolian Natural Gas Pipe bringing about 10 bcm of Caspian gas to the EU via Turkey and opening the Southern Gas Corridor that is to be put into operation in 2019 at the earliest. Meanwhile the question is what energy are we going to obtain until then? In addition, what is the state of play in diversification of gas transport infrastructure and fulfilment of redundancy rule now, "for the winter ahead"? Nevertheless, you could choose your answer yourself from this range: bad, very bad or worse than ever. We have to return to the problem related to the Russia–Ukraine gas disputes. In 2013 supplies from Russia in the volume of 136, 2 bcm amounted to about one third of EU natural gas imports. 86 bcm of those gas supplies or more than 60% is pumped by transit through pipelines across Ukrainian territory prior to arriving in the EU, especially to the countries of South and South-East Europe. It is common knowledge that Ukraine has gone into deep political crisis that has a disastrous influence on economic situation within the country. Kiev is in arrears for gas supplied already from Russia more than $ 5 billion and refuses to pay the debt. For this reason on June 16 Russian company Gazprom switched to advance payment from Ukraine's Naftogaz on deliveries of natural gas in accordance with the contract and completely cut gas to Ukraine. Since then only gas for Europe has been transmitted via Ukraine in volume of 185 mln cm per a day. The talks on the gas dispute probably will be resumed only August 29. I already wrote a month ago about technical condition of the Ukrainian gas transport system (GTS). Despite current condition of gas pipes and other equipment has deteriorated beyond the limits caused also by lack of proper repairs since Soviet times the Ukrainian parliament now is trying to pass a bill allowing EU and US companies to lease up to 49 percent of GTS, which is totally owned by Naftogaz Ukraine. In the beginning of June the Ukrainian parliament passed the first reading of this bill but further the process come to standstill because a number of Ukrainian MPs demanded to include additional clause regarding approval of structure of shareholders at the company - GTS operator that means a battle for controlling over the Ukrainian GTS is still continuing. Whether Western companies really would like to take on lease such high risk assets taking into account its technical condition and chaos in Ukrainian economy it is really a doubtful question. However, in an extended run it does not matter for us what will happen with a new Ukrainian law because all risks of applying the GTS for gas transit from Russia to our countries would still exist since it is impossible shortly to improve dramatically its technical condition. Besides the lack of operating reserves of gas, necessary for the upcoming winter will drag Ukraine to illegally siphoning off gas supplies intended for Europe how it happened in 2009. There are also risks posed by politicians who are interested in enlarging the conflict between Ukraine and Russia and who are willing to use the problem with the Ukrainian GTS and the gas disputes for escalating tension in the region. However, what will happen if because of these risks Russia shuts off gas valves for supplies to Europe via the Ukrainian GTS? In accordance with the Strategy, the European Commission is launching energy security stress tests in light of partial or complete disruption of gas supplies via Ukraine in the upcoming winter. This is correct action but obviously, it is not enough! According to the redundancy rule, we must use reliable tires ensuring road safety and so the same for security of gas supplies there is a necessity in developing the transport infrastructure including extension of modern fail-safe gas transmission routes. You could be aware yourself and by reading my previous posts that the international project of South Stream gas pipeline now is one of few realistic opportunities of strengthening security of gas supplies. Siberian gas having been already familiar to a half of Europeans for many years should come via the South Stream to Europe in autumn next year bypassing politically, economically and technically unstable Ukraine. 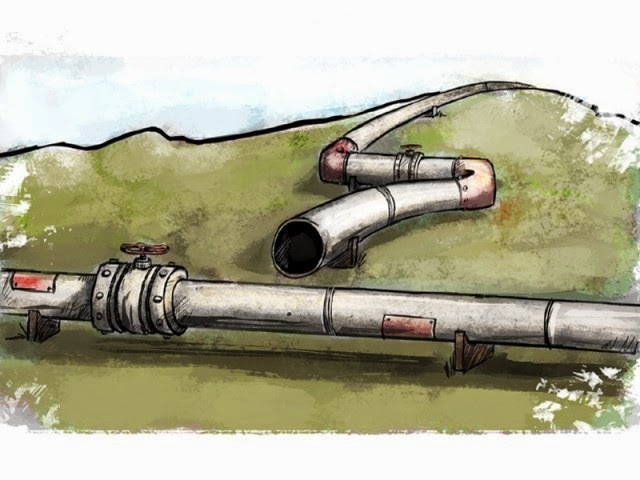 But actually now there is an intention of getting European companies and indirectly all of us into a mess named the Ukrainian GTS since it is proposed to use it further as an old, rusted wheel instead of replacing it by a new one - by a new gas pipeline, by a new route and by many other "news". They are arguing that substitution for a new modern pipeline will cause an increase in dependency on a certain supplier of gas up to a critical level. Nevertheless, it does admit of doubt why it might happen only because of shifting from one gas transmission route to another. In fact, we are speaking about the change of transport routes of existing volumes of gas supplies. Originally, under the contracts with Russian Gazprom the Ukrainian GTS was obliged to pump 120 bcm of natural gas. After putting the Nord Stream pipeline into operation and shifting the gas supplies route to Germany via Baltic Sea the transit via Ukraine decreased down to 86 bcm last year. Moreover, it will shrink again by 60 bcm because of the South Stream. Reportedly, it causes a drastic reduction of the commercial value of the Ukrainian GTS. Why should we worry? European gas consumers should not care about the commercial value of the Ukrainian GTS, should they? Ultimately, it doubles troubles for Ukrainian authorities and their foreign principals. Nevertheless, neither in Brussels no in Ukraine they would like to see deeply an economic impact of scenario if Russia really would be pushed for the decision of turning off the gas valves on transit supplies to Europe via Ukraine, as it took place in 2009. However, it would be another story.